Miss Imperial (17 Oct 06 - 10 Sep 07): "Stale popcorn! Don't you stand in your chair." "Stale popcorn! Don't you stand in your chair." Don't you stand in your chair." We might end up at the movies tonight. In my gradual reacquaintance with nine-to-fiveing, nothing is more automatic than Working for the Weekend. Going Out for Drinks with Co-Workers (Straight from the Office) seems like it's also on the horizon, though it's not a regular option for temps like me. But going to the movies? It could be a ritual; it could happen. Friday night's alright for escaping reality, no? *HE LEADS A SAD LIFE! 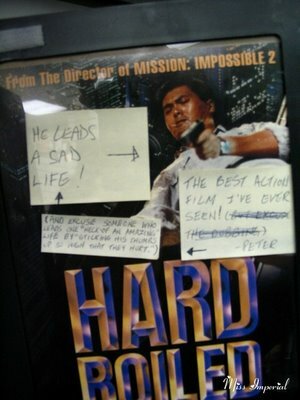 THE BEST ACTION FILM I'VE EVER SEEN! BUT EXCUSE THE DUBBING [no wait, scratch that]. AND EXCUSE SOMEONE WHO LEADS ONE "HECK OF AN AMAZING" LIFE BY "STICKING HIS THUMBS UP SO HIGH THAT THEY HURT." TRACK LISTING: Bad Brains, "At the Movies"